The Great Welcome Week Steamboat Race, 1949. Neat feature at the link below includes radio broadcasts of the race with interviews with officers from the boat and sports announcers narration. The feature was written by the grandson or grand daughter of Captain Robert R. Hanna. In 1949 the first of three races took place as part of Pittsburgh's Welcome Week celebrations. The first of these races was between Carnegie-Illinois Steels' Homestead and Jones and Laughlin's Wm. LARIMER JONESilliam. These boats raced again in 1951 and statistical information concerning these two boasts can be found on the page dedicated to the 1951 race. In 1949 the race was broadcast live on WEDO radio. My grandfather, Captain Robert R. Hanna was given a collection of 78 rpm recordings of the race and clips from those recordings can be heard thought out this race page by clicking on the link provided. During these three races Kasper Monahan, the Drama Editor for the Pittsburgh Press, and Chet Smith, who was the Sports Editor with the Pittsburgh Press, each served as the Commodore on one of the boats. Kasper was the Commodore on the HOMESTEAD in 1949 and 1950 and Commodore on the Wm. LARIMER JONES in 1951. Chet served as the Commodore on the Wm. LARIMER JONES in 1949, the TITAN in 1950 and the HOMESTEAD in 1951. The Race stated at Brunot's Island in the Ohio River to the Smithfield Street Bridge of the Monongahela River. The HOMESTEAD got out to an early lead, but half way through the race the JONES went ahead. During the final leg of the race the HOMESTEAD retook the lead and won by a foot. 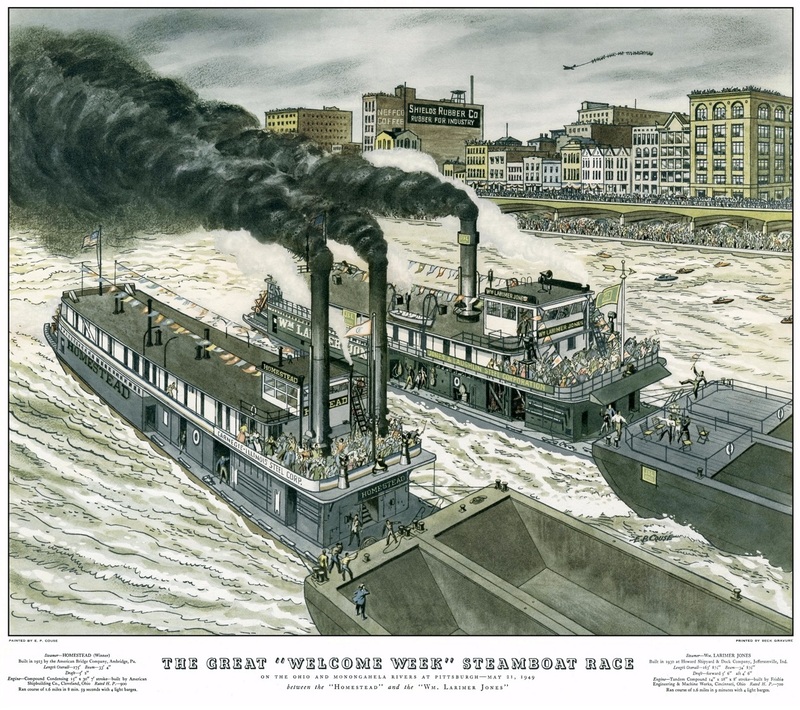 During the race the HOMESTEAD automatic stoker broke down and lost steam between the Point and the Smithfield Street Bridge. Forty-nine year old Jess Beckner from Clairton grabbed a shovel and continued to feed the boiler by hand. After the HOMESTEAD was declared a winner and the bets paid off Captain Robert Hanna and chief engineer Evert Moats gave their final thoughts on the race." Built in 1930 at Jeffersonville, Indiana by Howard Ship Yard She was a duplicate of the TITAN. Named for William Larimer Jones, president of Jones and Laughlin Steel Company. This boat had no pilot wheel and was steered with levers, a first among boats of that time Dismantled and sold for scrap in 1953. Spectacular poster-style cover for a 1915 Streckfus travel brochure promoting their trips on the Upper Mississippi. The artist painted the steamboat in a way that gives it a 3 dimensional effect, out of the monitor and onto your keyboard! If you've got enough Streckfus related material in my wing of the museum you can use this as the introductory illustration and the others following it. 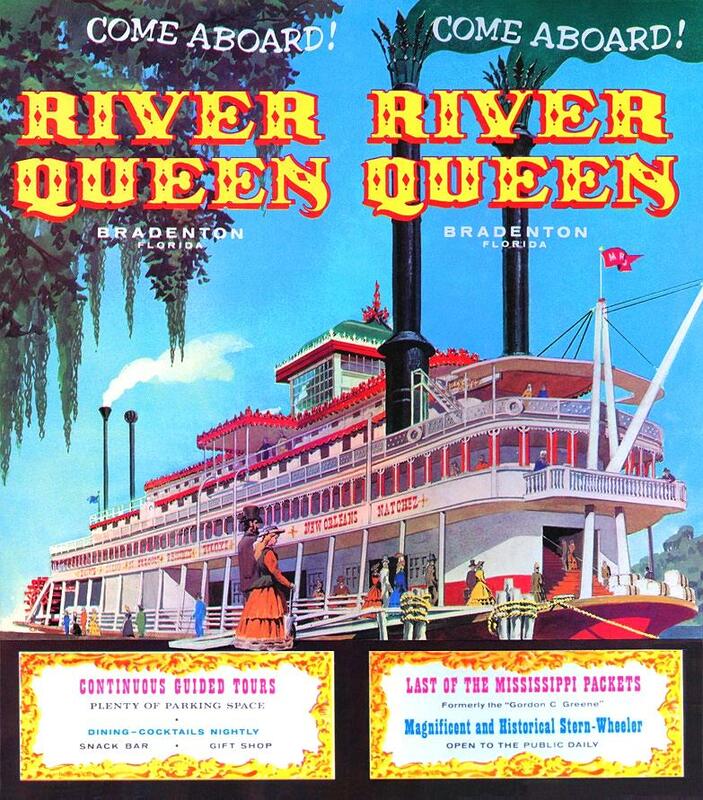 Unfolded brochure circa 1957-59 promoting the RIVER QUEEN (formerly GORDON C. GREENE) while she was a tourist attraction floating in a basin filled with fresh water created by a coffer dam in order to keep her hull safe from the salt water in the Manatee River at Bradenton, FLA. When completely unfolded the brochure measures approx. 9 x 12 inches. The artist enlarged the pilot house considerably to make it more conspicuous on top of the Texas cabin. The stiff folks dressed in period costumes look a bit like "waxworks." Steamboat Landing attraction opens a year from now . . . see details and link below. Welcome to Steamboat Landing. 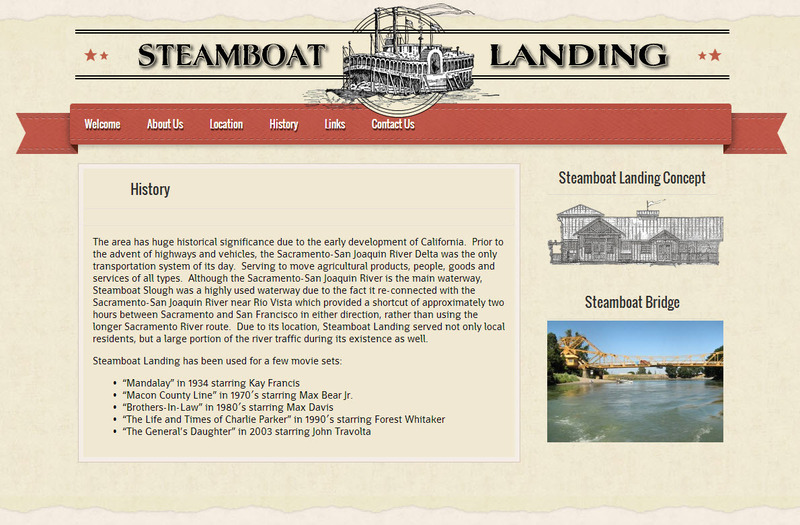 Steamboat Landing was established sometime in the late 1800s or, at the latest, in the early 1900s. It is located about 20 miles south of Sacramento on State Hwy 160 at the junction of the Sacramento River and the northern confluence of Steamboat Slough. On the property is also a natural sandy beach and a guest boat dockage. The concept for Steamboat Landing is of a country eatery/deli/bakery located in a country farm setting along the Sacramento River. The eatery will serve simple, but wonderful food to the local traffic and the traveling tourist trade by highways and waterways. The menu will include such items as rotisserie chicken, ribs and turkey. We will offer deli style foods such as meats, cheeses, sandwiches, soups, salads, breads and baked goods. Our baked goods will focus on pear products such as pies, breads, jams, jellies, chutneys, turnovers, fritters, etc. Pear ice cream and pear milk shakes, along with other favorite flavors will be offered. Beer and wine (some pear), soda, iced tea, other drinks and water will be served. The main activity area is the "Pear Park" which is about 24 acres directly adjacent to Steamboat Landing. The Pear Park will have many picnic areas and activity areas for the whole family. 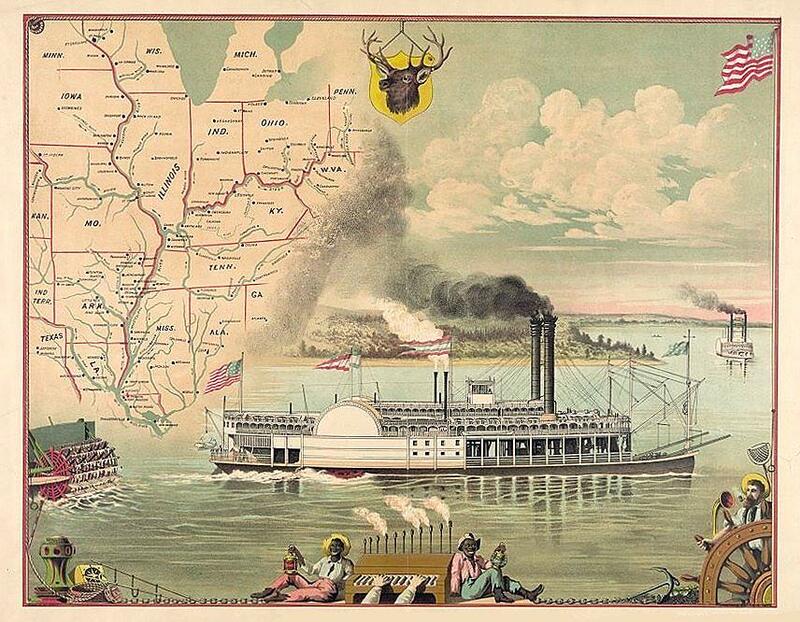 Travel poster circa mid '50's to mid '60's with graphic of a sidewheeler NATCHEZ. 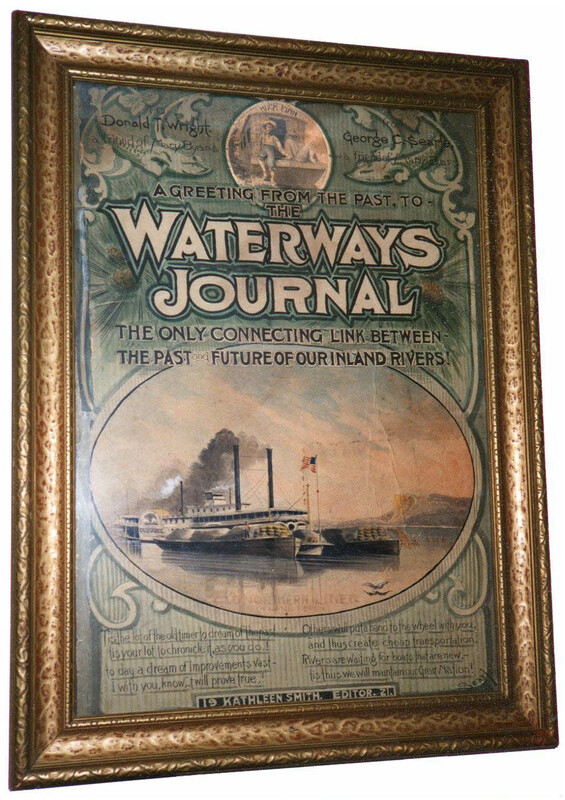 "New Orleans-Steamboat Natchez Mississippi River Paddlewheeler - Illinois Central Railroad"
This excellent 13 x 19 inch poster came from an eBay auction. Editor's Note 3/22/2009: Items may come and go on eBay. These posters are available at this writing. I hear from Dave Thomson that the image is crisp and clear and the item arrived in excellent condition. 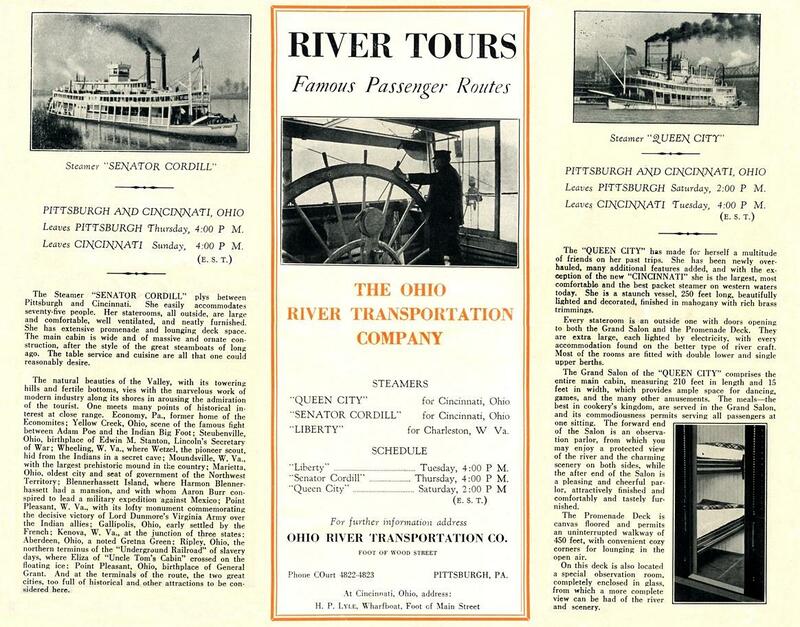 The attached is a composite of 3 of the 8 vertical "columns" from a brochure for "River Tours" aboard the QUEEN CITY, SENATOR CORDILL and the LIBERTY. The "columns" as displayed in this comp are not in the order that they appear in the brochure but the arrangement looks satisfactory for presentation. This brochure has to pre-date 1934 when the SENATOR CORDILL expired. The LIBERTY lasted until 1938 and the QUEEN CITY until 1940. You probably have all the old DQ brochures. I got this on eBay because I liked the quaint styling of the cover with graphics and text done in an old timey way including the "guarantee" at the bottom assuring passengers of top notch service and staff. I subdued the red lettering in Photoshop a bit, seemed a bit too bright to me. The effect caused the color to taper off pretty much to black and white at the bottom which is OK since it leads you eye to the courtesy guarantee. From the looks of the stateroom interiors this would have been early on in the DQ's career back East since the headboards on the beds look non descript and inexpensive and the old Professor of Cally-ope is featured in a photo also and I gathered he was an early member of the crew. Back in '88 I was in St. Louis and photographed this either at the office of the Waterways Journal itself or at the Mercantile Library, I was in both places that October and have a hunch that the Mercantile owns it. Apparently it was hand painted by George C. Searle and dedicated to Donald Wright and mentions that both of them are "friends of Mary Byars" who might have been the person who commissioned the artist to do this. tis your lot to chronicle it, as you do! I with you, know . . . twill prove true! Others will put a hand to the wheel with you. and thus create cheap transportation. Rivers are waiting for boats that are new - tis thus we will maintain our Great Nation! Kathleen Smith is given as the name of the Editor and the date appears to be 1921. Huck Finn is at the top on a shanty boat inside a circular vignette and below the Dubuque is depicted as a "Northern Liner on Lake Pepin" (you can barely read that if you look closely). Original poster matted and framed here in the collection measures approx. 10 X 13 inches. 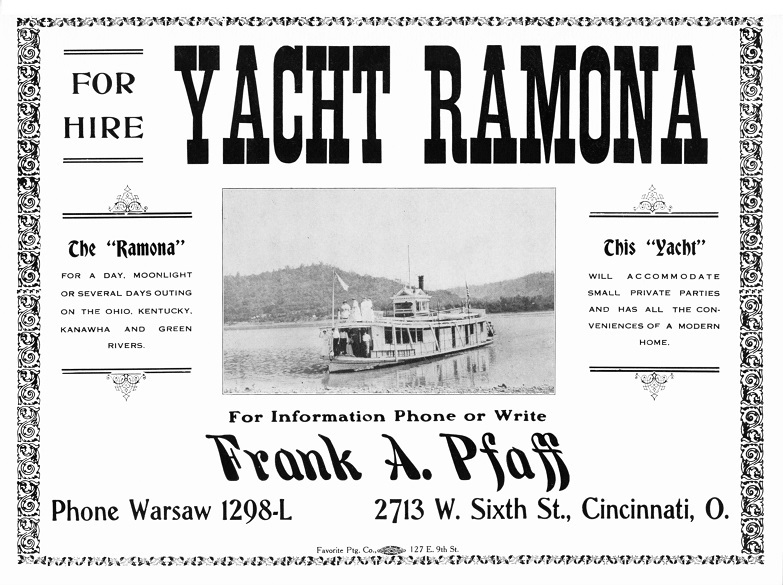 Text on the "FOR HIRE" poster for the RAMONA gives information about chartering her for cruises. The portside view of the RAMONA from the Murphy Library shows off her profile very well. 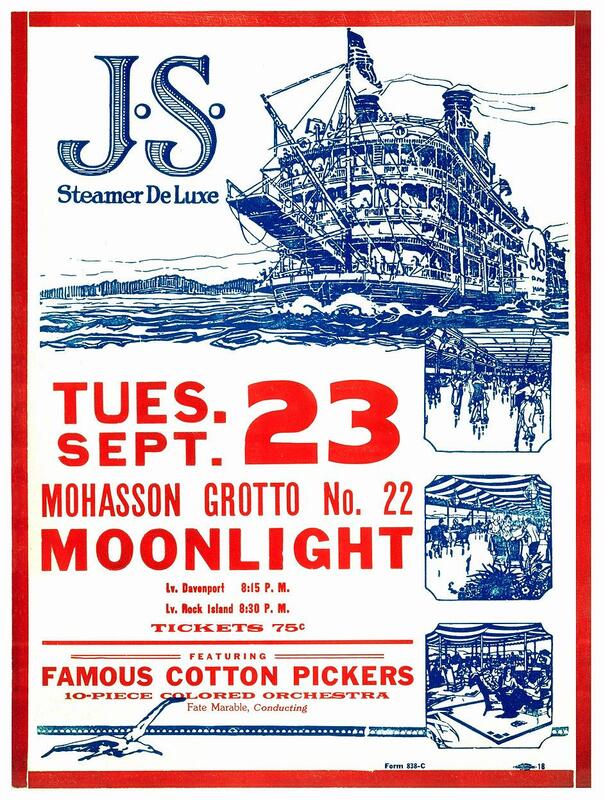 Original letter press poster promoting an excursion aboard the Streckfus line boat J.S. DeLUXE in an antique frame displayed downstairs for many years and finally got around to scanning it without removing it from the frame (upper and lower halves) and assembled it and finessed it to make the attached file. Overall image area as seen here is 11-3/4 X 15-3/4 inches.September 23 fell on a Tuesday in 1919, that was how I determined the year. The J.S. DeLUXE (1918-1939) was built using the engines and hull of the packet boat QUINCY (1896-1918).The DeLUXE was the flagship of the Streckful line until the PRESIDENT was launched in 1934. African American musician Fate Marable conducted the doubly racial stereotyped-name proclaimed here as a "10 Piece COLORED Orchestra" - the "FAMOUS COTTON PICKERS." Fate Marable (2 December 1890 - 16 January 1947) was a jazz pianist and bandleader born in Paducah, Kentucky, and learned piano from his mother. 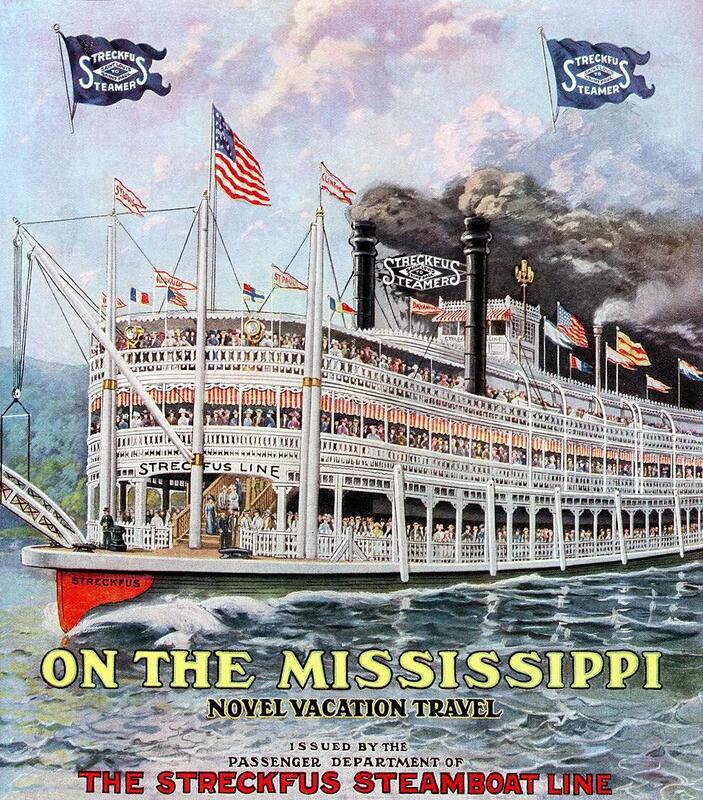 At age 17, he began playing on the excursion steamboats plying the Mississippi River. Fate soon became bandleader for boats on the Streckfus Line, which held dances and excursions along the river from New Orleans, Louisiana to Minneapolis, Minnesota.Marable appreciated the new "jazz" sound being played by the New Orleans musicians, and the bulk of his band members were recruited from that city. Members of Marable's bands were expected to be able to play a wide variety of music, from hot numbers to light classics, both play from memory and from sheet music, and above all to keep the dancers happy.Marable was a strict bandleader, demanding musical proficiency and rigid discipline from all his band members, yet allowing them to develop their individual strong points. Trumpet virtuoso Louis Armstrong's gift for improvisation was recognized as such by Marable, and he allowed "Satchmo" to improvise his breaks rather than play them note for note.Marable's band served as an early musical education for many other players who would later become prominent in jazz, including Red Allen, Baby Dodds, Johnny Dodds, Pops Foster, Narvin Kimball, Al Morgan, Jimmy Blanton, and Zutty Singleton. 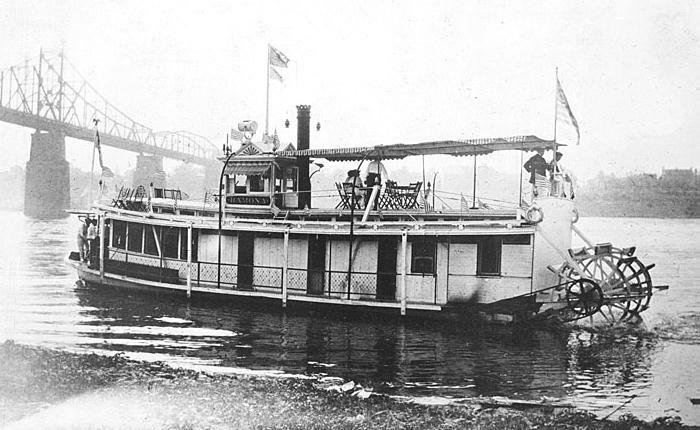 In addition to piano and band leading, Marable played the "cally-ope" (calliope) on the boats, the penetrating music from which could be heard for miles up and down the river.So much water from condensing steam produced by the calliope showered down on Marable that he played the keyboard wearing a raincoat and hood. Fate Marable died of pneumonia in St. Louis, Missouri. He was 56 years old. He is buried in Oak Grove Cemetery in Paducah, Kentucky. I looked up the cruise sponsors: MOHASSAN GROTTO NO. 22 (NOT "Mohasson" as it's spelled on the J.S. DeLUXE poster) and found that it has been an honorable Masonic order in Davenport, Iowa since 1908, eleven years before the 1919 excursion. After 100 years, Mohassan Grotto remains active in the Quad Cities, [a group of five cities straddling the Mississippi River on the Iowa-Illinois boundary, in the United States.They are Davenport and Bettendorf (in Iowa) and Rock Island, Moline, and East Moline (in Illinois)]. Zipping along in their mini-bikes, miniature Model T patrol or even an antique fire truck painted in the colors and pattern of a Holstein cow, the men in black fezes have delighted generations of Quad-City area parade spectators with their playful antics. They are members of Mohassan Grotto No. 22, Mystic Order of Veiled Prophets of the Enchanted Realm of North America. It is a complicated name for an organization whose mission is simple: to foster a spirit of good fellowship while helping their fellow citizens in a variety of humanitarian causes. This month marks a milestone for Mohassan Grotto, whose members all are Master Masons. On Feb. 26, 1908, a class of 65 candidates was formed, a prelude to the Grotto receiving its charter on July 8 of that year. As they observe their 100th anniversary, the 350 members of Mohassan Grotto remain an active and vital part of Quad-City life. Like other Masons—a fraternity of men who practice brotherly love, mutual assistance, equality and trust between each other—they are out front in their community. This year, they expect to raise more than $30,000 for a variety of causes ranging from cystic fibrosis research to organizations dealing with hearing disorders, Alzheimer's disease and developmental disabilities. They contribute to a national foundation that provides dental care to children with special needs. Another boost to the community is a scholarship program that awards $8,000 annually to eight students in fields such as medicine, nursing, dentistry and other health sciences. Along the way, Mohassan Grotto members and their ladies auxiliary, the Caldron, enjoy good times at their headquarters, Club Mokan, 4227 W. Kimberly Road, and their bingo parlor in the former Northwest Turners Hall at 1602 Washington St., both in Davenport. Members belong to several units that include the mini-bikers, the Model T patrol, the Fire Bulls fire truck, a drum and bugle corps, a dance band and a Dixieland jazz band. "We are the fun part of Masonry," says R. Blaine Arnold, a past Monarch of Mohassan Grotto. Many members have followed in their father's footsteps. They include Norman Peters, who has, for 35 years, been the editor of the Booster, the group's monthly publication. His father, Frank Peters, was the editor for 25 years and saved every issue of the publication beginning with its debut in January 1928. 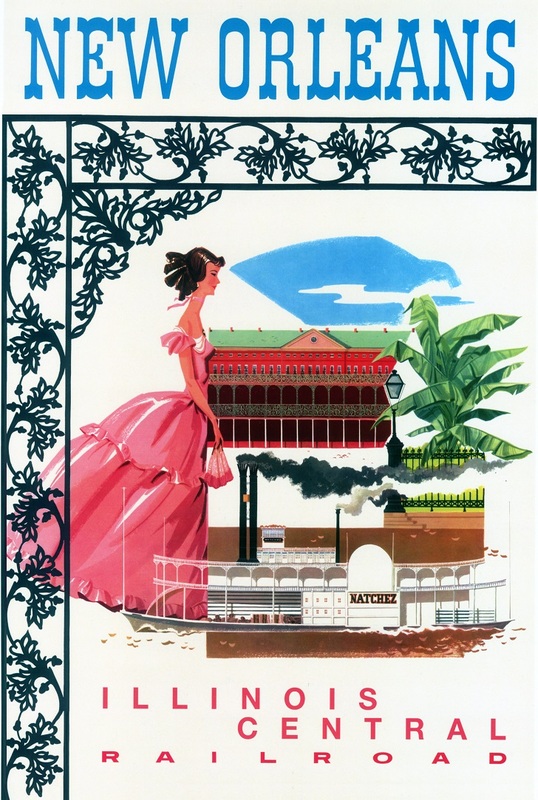 Norman Peters compiled a centennial history of Mohassan Grotto based on his father's collection of the publications. The Grotto story begins in 1907 when Frank Kincaid, a Mason from Davenport, visited a Grotto in Chicago after an earlier Masonic club in Davenport had failed. In November of that year, he gathered seven other Masons as the nucleus for a Grotto. They named it Mohassan Grotto in honor of Mohassan, a guardian of a prince in ancient Persia. Mohassan Grotto has the distinction of being the 22nd-oldest of the nation's 280 Grottoes and the first one west of the Mississippi River. Today, it is the largest of the four Grottoes in Iowa and one of the largest in the nation. During its early years, members met at several downtown spots before moving in 1923 to the then-new Masonic Temple at 7th and Brady streets, which is known today as Palmer College of Chiropractic's Lyceum Hall. In the 1940s through the early 1950s, the Grotto operated its social club, Club Mokan, in the basement of the Kahl Building in downtown Davenport. Another festive place was Mokan Country Club near Iowa 22 and South Utah Avenue, west of Davenport. The Grotto acquired the wooded site in 1950 and replaced its original clubhouse with a new facility in 1977. Since 1988, the Grotto has been headquartered at its Kimberly Road lodge, which it expanded in 1997. In the early 1990s, it acquired the old Northwest Turners Hall. It can seat 400 people for bingo games, a major fundraiser for the Grotto. Membership once stood as high as 1,600, but while the current rolls are far from that, they are increasing, members say, as the club focuses on family activities. Many members of Mohassan Grotto also belong to the Shrine, another organization of Masons noted for its children's hospitals. Shriners wear red fezes rather than the Grotto's black. Like Grotto members, though, they use an Arabic/Persian motif in their ceremonies and enjoy fun activities. While not as well known as the Shriners, Grotto members take it all in stride. "Some say the Grotto is the best-kept secret in Masonry. Most of the public doesn't realize we have given several million dollars through the years to many different charities and to so many causes that we can't begin to list them all," Arnold said.